This full sized 34mm. 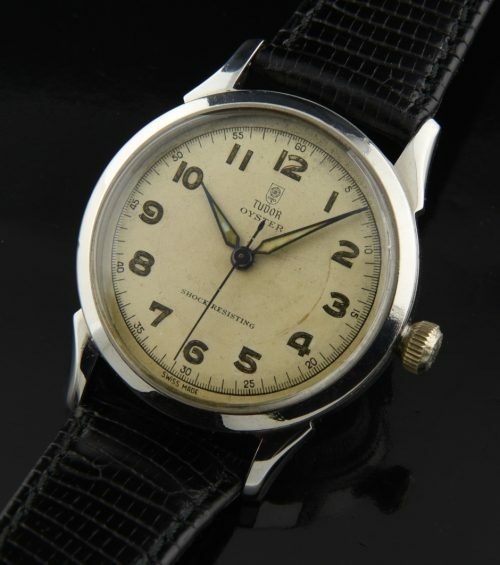 stainless steel TUDOR dates to the late 1940’s and has a fine looking TUDOR OYSTER case and correct OYSTER PATENT winding crown. This was the largest size watch TUDOR made during this era. The original SMALL ROSE dial looks great-the hands did touch at some time many years ago near the #3. The blued steel dagger style hands are original.The manual winding fine TUDOR movement was cleaned and accurate. These early TUDORS with a full-sized case are becoming more scarce these days.